US$ 1250 / person ? 2 Paro - Haa Ride 65 km, ➚1.600 m, ➘1.300 m. First morning we will start start riding to Chele-la pass (3.800 m). In good weather there are wonderful views from here. 4.000 meters hill can be summited by hike from here. Subsequently we will descend to pristine Haa valley and visit few places of interested like the local temples. Evening cultural show. 3 Haa - Chuzom (ride), Chuzom - Thimphu (by car) Ride 75 km, ➚150 m, ➘750 m. This is bit long but not so demanding day as we don't have that much up ann downs. Scenic road leads from Haa to Chuzom where it connects to highway from India. There is a lot of traffic here so better to be continue by car. If you go by cycling, it's some 30 km more gradually ascending road. Evening exploring the town. 4 Thimphu We can either make easy and nice trip to the north to Dodina village (30 km round trip, ➚250 m, ➘250 m) visit few other sights around in Thimphu and possibly do some shopping or we can take more serious ride to Dochu-la pass (45 km round trip, ➚650 m, ➘650 m.) In the evening we will visit Tashichho dzong, the seat of the king. 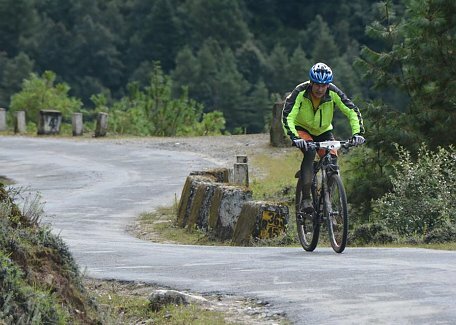 5 Thimphu - Paro Ride 65 km, ➚150 m, ➘300 m. From Thimphu it's easy ride to Chuzom and then very gentle almost unnoticeable ascend to Paro. On the way we can stop to see the suspension bridge made by ancient iron chains. After arrival to Paro, we will visit National Museum and Paro dzong. 6 Paro Ride 30 km, ➚450 m, ➘400 m + 5 hours hike. Today we will ride to the castle ruins of Drukyel dzong. We will visit ancient Kyichu lhakhang temple on the way. After picnic lunch we will make a great hike to ubiquitous Tiger's Nest monastery overlooking the valley from the high cliff. Hike takes from 4 to 5 hours and it's one of the trip's highlights. 7 Departure Departure from Bhutan. Program subject to time of travel.